TUSCALOOSA, Ala. – The No. 6-ranked Alabama gymnastics team closed out the 2018 regular season with a 197.925-197.150 loss to top-ranked Oklahoma Friday night in front of a crowd of 9,068 in Coleman Coliseum. DENTON, Texas (March 18, 2018) - Schyler Jones of Texas Woman's University gymnastics made the most of her last regular season home meet inside Kitty Magee Arena by recording a career-high 39.400 in all-around against the top-ranked team in the country, Oklahoma, on Senior Day Sunday. BATON ROUGE- Junior Sarah Finnegan secured two perfect 10.0 scores in the same meet for the first time in her career and the third time in school history to lead the second-ranked LSU gymnastics team to a team score of 198.125, Saturday afternoon at the Maravich Center. SALT LAKE CITY — The No. 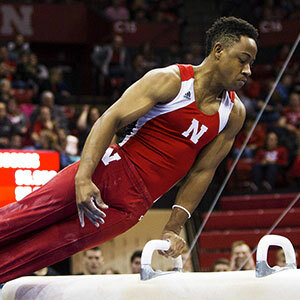 4 Ute gymnasts exploded out of a two-meet slump in their regular season finale, running over No. 20 Georgia 198.150-196.350 before fired up crowd of 15,208 and a live ESPNU television audience. PISCATAWAY, N.J. -- Another trophy and banner will make their home in the Donald R. Shepherd Women's Gymnastics Center in Ann Arbor as the seventh-ranked University of Michigan women's gymnastics team captured its fourth Big Ten regular-season title in the last six years on Saturday (March 17) at the Big Five Meet at Rutgers. SEATTLE – In the final home competition of the season, the #8 Washington GymDawgs recorded a score of 196.950, falling just short of a school-record fifth 197 but making it three straight meets with a score over 196.900. NORMAL, Ill. – Redbird Arena and the Illinois State gymnastics team hosted one of the best teams in the country Wednesday night, as the Redbirds hosted No. 9 Kentucky in a dual meet in front of over 400 fans. EAST LANSING, Mich. – The University of Illinois women's gymnastics team hit a season-high 196.850 team score on Saturday afternoon to win the B1G Five Meet at the Jenison Field House. FAYETTEVILLE, Ark. 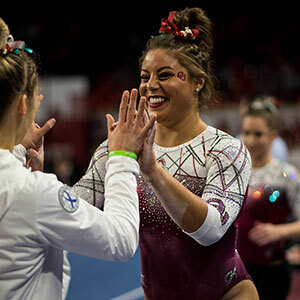 – The 11th-ranked Arkansas gymnastics team took first at the Arkansas Tri meet, topping 15th-ranked Denver and 26th-ranked Iowa State, en route to another school record score of 197.300. SACRAMENTO, Calif. — A career high from Annie Juarez in the all-around lifted the Sacramento State gymnastics team to its third consecutive home score of at least 195.000 on Friday night at The Nest. KENT, Ohio – The Kent State gymnastics team posted a final team score of 196.325, its second-best this season, to defeat No. 18 George Washington (195.650) and Temple (195.075), on Senior Night. CHAMPAIGN, Ill. - The third-ranked Fighting Illini men's gymnastics team couldn't overcome a pre-meet injury to senior Bobby Baker, as the team fell to No. 1 Oklahoma 412.700-399.700. UNIVERSITY PARK, Pa. - On Saturday, the Penn State seniors, who once dreamt of competing for the Blue and White, closed the door on their dedicated Penn State gymnastics careers in Rec Hall. MINNEAPOLIS - The No. 6 Gophers posted their highest mark at the Maturi Pavilion of the season Sunday. They beat the California Bears 411.150 to 388.550 on Senior Day. ANNAPOLIS, Md. – The No. 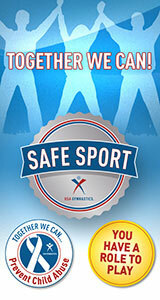 9 Navy gymnastics team closed its regular season schedule on Saturday with a hotly-contested tri-meet versus No. 7 Michigan and No. 14 William & Mary. SPRINGFIELD, Mass. - March 18, 2018 - Competing in Blake Arena for the final time this season, the Springfield College men's gymnastics team was clipped by Army, 393.300-387.000 on Sunday afternoon. WACO, Texas - A strong second-half team all year, Baylor's top-ranked acrobatics & tumbling team (6-0) followed a similar script in dominating the seventh-ranked Fairmont State Fighting Falcons, 284.835-266.410, Monday night at the Ferrell Center. 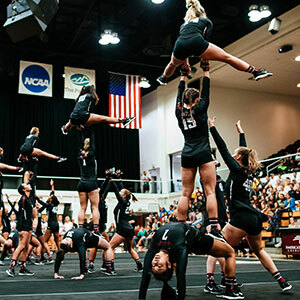 AZUSA, Calif. -- Azusa Pacific used another strong finish to post its second consecutive come-from-behind win to remain unbeaten through its first four meets of the 2018 National Collegiate Acrobatics & Tumbling Association (NCATA) season after edging Quinnipiac by 31-hundredths of a point Tuesday night at the Felix Event Center. ERIE, Pa. - Gannon Acrobatics and Tumbling improved to 4-2 after a 270.50-230.66 victory over West Liberty on Saturday (Mar. 17), at the Hammermill Center. PHILIPPI, W. Va—The Alderson Broaddus acrobatics and tumbling team defeated Glenville State and West Virginia Wesleyan in a tri-meet Saturday at Rex Pyles Arena. BRISTOL, Tenn. – The King University acrobatics and tumbling team took an early lead in the contest and never looked back as they defeated Condcordia Wisconsin 245.735 - 240.265 on Senior Day for their first victory of the season. SPARTANBURG, S.C. – The Converse Acro and Tumbling team picked up a dominant win over Georgetown College on Saturday afternoon inside the Weisiger Center.